Urban assessment - socio-economic conditions, new real estate practices, HQ-to-flexible-workspace transformation. Summer 2017. 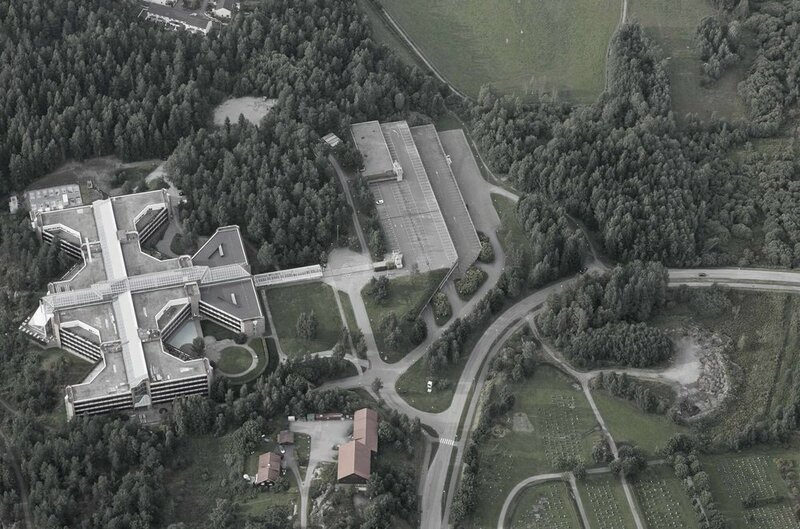 This assessment was commissioned by Aspelin Ramm, with the goal of investigating the potentials after IBM's exit out of Rosenholm Campus (RC), a 42 000sqm commercial real estate. The entire office complex served as IBM headquarters from 1987-2006 (only 25% the last years). It is located in Oppegård kommune, and was designed by Geir Grung. The publication was written under the title, "Rosenholm Campus - en interdisiplinær utredning 2017", (an interdisciplinary assessment 2017). This strategy is the theoretical part of a bigger strategical constellation, with The Worst on graphical profile, and Montaag on design. Assessment PDF (7mb) NB Norwegian version only! Aspelin Ramms key goals for RC post-IBM (25% vacancy), were to answer to the dynamics of future workspaces (freelancers and small businesses in more flexible workspaces), and attracting the creative youth (next generation knowledge workers). This assessment question whether if these goals are valid at all, as the investigation both debunks and partially confirms AR's key goals, seeking out the geographically intrinsic, as opposed to the conceptually preconceived. More importantly, the assessment concludes with a multi-faceted proposal of both material and immaterial concepts. The data is gathered from the municipal plan, public reports, financial newspapers, expert interviews, and observations etc. Through a series of exploratory investigations into lobbyist mechanisms, generating buzz, geographical conditions, such as demographics, local culture, commercial- and business tendencies, and real-estate. This assessment dabbles in fields of social science, lobbyism, urban planning, technological innovations, organisational and real-estate theory, in order to provide a complete picture of RC's challenges and intrinsic potentials. The exit of IBM is not an isolated incident at RC. Every major corporation in Mastemyr Næringspark (business cluster in which RC is a part of), has already left, or on their way (IBM, Boscch, Kodak, Volvo, Unitor, etc.). There will be a tidal change of both social and professional nature in Mastemyr that has not occurred in the upcoming years. Organic clustering of gazelle companies in the Mastemyr area (third most dense municipality in Norway), and other notable subcultures. The youths (19-24) only represents 6% of Oppegård with 1% growth, whereas the millenials-middle aged segment represented 52% with 15% growth. The business tendencies of Oppegård shows that a staggering 95,8% of its citizens works in small- or medium-sized firms (1-9 employees), yet 70% commute out of the municipality for work. There lies an untapped potential in successfully attracting millenials to middle-aged target groups in small businesses, supporting the claim of establishing the future of workspaces (95,8% of the workforce in Oppegård).And against the odds, a parallel strategy attracting a younger generation (The Worst will be looking into this). The proposal range from everything from automated buses, syndicates, curation, conceptual and cultural planning through furnishing and programmatic accuracy etc.